The Egyptian government has disabled most Internet and cell phone services in an apparent effort to disrupt the anti-government protests gripping the country. Egypt's four primary Internet providers all stopped moving data early Friday, effectively cutting off Egyptians from the outside world and each other. 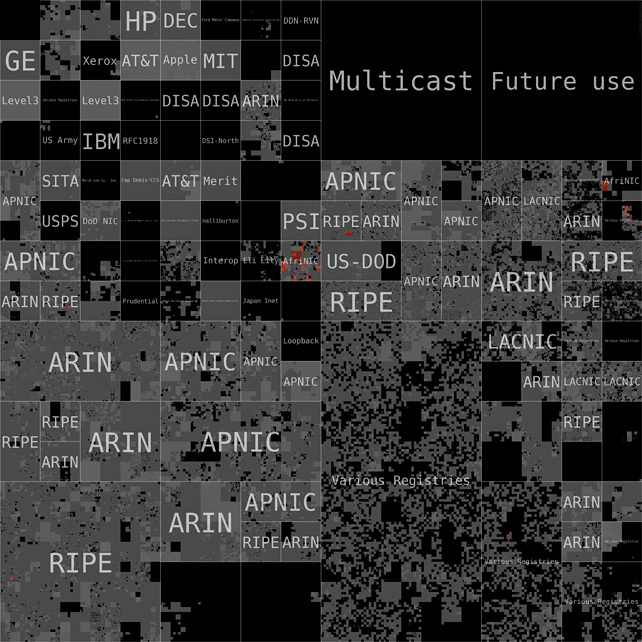 From the RIPE Report: "The graph shows Border Gateway Protocol (BGP) updates which occur when routers announce changes in routing. The top half shows announcements and changes, while the bottom half shows withdrawals which occur when routers inform each other that a range of addresses is no longer reachable. Prior to 22:00 on 27th January, the graph displays the normal background noise of BGP updates for Egyptian prefixes - hovering around 200-400 announcements per minute. Clearly visible after 22:00 is the huge spike in updates and withdrawals when many Egyptian prefixes were withdrawn from the Internet. The many updates visible at the time the address ranges were withdrawn are due to the nature of the BGP protocol. It takes some time for withdrawals to propogate between all routers and during this period, the routers continuously inform each other of the changing paths." Even before their communications blackout, Egypt really was a small part of the Internet in absolute terms, just a few thousand routable networks out of nearly 400,000 making up the global IPv4 address space. 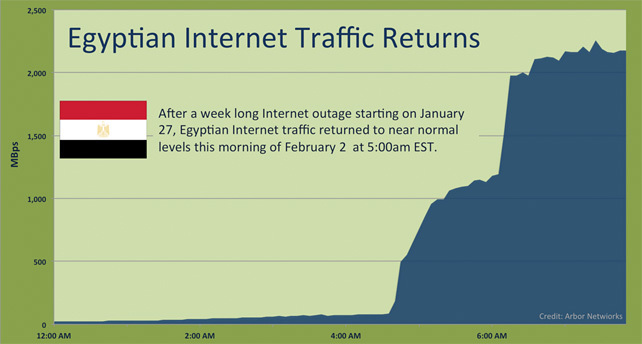 After a week long Internet outage following widespread social unrest and political protest, Egyptian Internet traffic returned to near normal levels this morning at approximately 5:30am EST. A graph of Egyptian Internet traffic from the vantage of carriers around the world both today and throughout the week below. A cursory survey of Egyptian Internet infrastructure shows all major providers and web sites are once again reachable from the rest of the Internet. Local Time: Saturday, April 20, 2019 12:08 AM PDT – Page Load: 0.3105 Sec.